Falkirk and Morton have agreed to end their dispute over manager Ray McKinnon after reaching an amicable settlement. 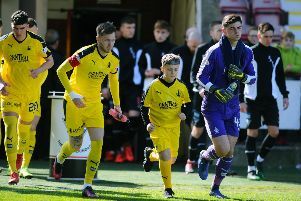 The two clubs have been embroiled in a bitter feud after McKinnon and assistant Darren Taylor joined Falkirk from the Greenock outfit in controversial circumstances last August – just three months following their appointment at Cappielow. An SPFL hearing into the appointment was held in December, with the Bairns found guilty of breaching two rules and were hit with a £60,000 fine, (£20,000 of which was suspended) with the proceeds going to the SPFL Trust. However, both clubs stressed they were keen to move on from the heated dispute after reaching an “amicable settlement”. A statement on Falkirk’s website said: “Falkirk confirms it has reached agreement with Greenock Morton to bring to an end the dispute with regard to our current management team of Ray McKinnon, Darren Taylor and Graeme Henderson. “We now look forward to moving on and working together with our colleagues in Greenock to re-build the strong relationship between both clubs. A statement on Morton’s website said: “Chairman Crawford Rae is pleased to announce that the club has reached an agreement with Falkirk in relation to the departure of Ray McKinnon and staff to Falkirk, putting to an end the dispute with Falkirk. “Whilst the agreement reached with Falkirk is confidential Mr Rae is pleased to report that he is satisfied with the outcome and that the two clubs can now move forward on suitably cordial terms, for the remainder of the season and beyond.